197 Beacon is located on the south side of Beacon, between Berkeley and Clarendon, with 195 Beacon to the east and 199 Beacon to the west. 197 Beacon was built in 1866-1867, one of a symmetrical pair of houses (197-199 Beacon). 197 Beacon was built by John Fisher Farrington and 199 Beacon was built by James W. Tobey. Click here for an index to the deeds for 197 Beacon. On May 1, 1868, 197 Beacon was purchased from John Farrington by boot and shoe dealer John William Brigham. He and his wife, Anna Dana (Blake) Brigham, made it their home. They previously had lived at 76 Charles. Anna Brigham died in May of 1888. 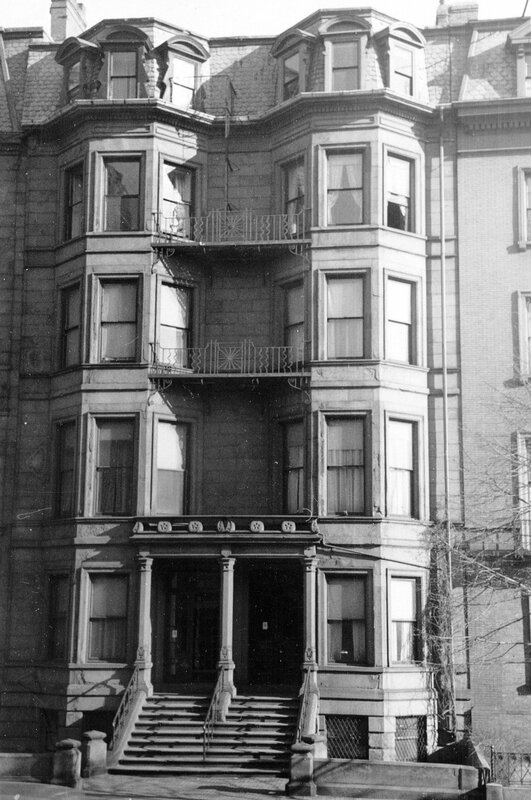 John Brigham married again in June of 1889 to Merial (Muriel) Leavitt Wilder and they lived at 197 Beacon. He died in April of 1890 and in August of 1890 she gave birth to their son, Harold W. Brigham. 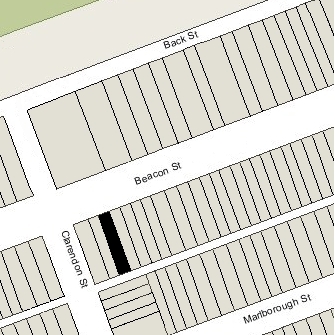 197 Beacon was not listed in the 1891 Blue Book. On April 25/27, 1891, 197 Beacon was acquired from John Brigham’s heirs by Dr. Henry Lyman Shaw, a physician. He and his wife, Annie Adams (Whipple) Shaw, lived at 19 Commonwealth. By the 1891-1892 winter season, 197 Beacon was the home of Dr. James Gregory Mumford, a physician, and his wife Helen Sherwood (Ford) Mumford. They had married in January of 1892, and 197 Beacon was probably their first home together. He also maintained his medical offices there. Living with the Mumfords were Helen Mumford’s brother and sister-in-law, Edwin Ford and Anne (Hopkins) Ford. He was a dealer in stained glass and ecclesiastical art. The Fords continued to live with the Mumfords in 1894, but had moved by 1895 to 14 Mt. Vernon. By the 1894-1895 winter season, the Mumfords had been joined at 197 Beacon by Dr. James Marsh Jackson, a physician, who also maintained his medical office there. He married in May of 1895 to Leonora Lewis. 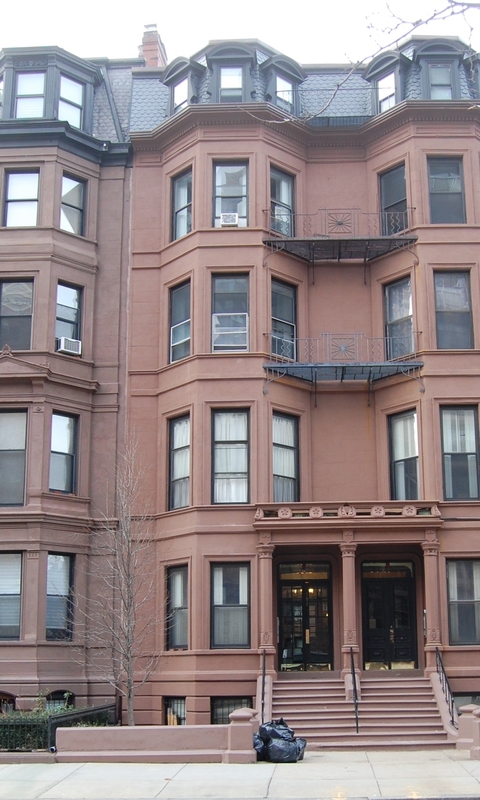 After their marriage, they lived at 134 Marlborough and then in an apartment at The Grosvenor at 259 Beacon. He continued to maintain his office at 197 Beacon until about 1899, when he moved it to 259 Beacon. The Mumfords continued to live at 197 Beacon in 1901, but had moved to an apartment at Haddon Hall at 282 Berkeley by 1902. 197 Beacon was not listed in the 1902 and 1903 Blue Books. On April 27, 1903, 197 Beacon was purchased from Henry Shaw by George Howland Stoddard. He and his wife, Eoline (Sheffield) Stoddard, made it their home. They previously had lived at 457 Marlborough. They continued to live at 197 Beacon until his death in May of 1925. After his death, Eoline Stoddard lived in Paris and New York. During the 1925-1926 winter season, 197 Beacon was the home of Robert William Leatherbee and his wife, Helen Dutton (Everhart) Leatherbee. They had married in February of 1925. Robert Leatherbee owned a dairy in the Hatchville district of Falmouth. He previously had been an executive with the Crane Company in Chicago, founded by the family of his former wife, Frances Anita Crane. They had divorced in the early 1920s and she had remarried in December of 1929 to Jan Masaryk, the Czechoslovakian Minister to Britain and future president of Czechoslovakia. On September 29, 1926, 197 Beacon was purchased from Eoline Stoddard by Montgomery Reed, a lawyer. By the 1926-1927 winter season, 197 Beacon was the home of Russell Burrage and his wife, Katharine Lee (Baxter) Burrage. They had lived at 18 Hereford during the previous season. They also maintained a home in Beverly Farms. Russell Burrage was a manufacturer of ammunition casings and later treasurer of a dredging company. On May 19, 1927, 197 Beacon was purchased from Montgomery Reed by Russell Burrage’s mother, Alice Hathaway (Haskell) Burrage, as his trustee. She and her husband, Albert Cameron Burrage, lived at 314 Commonwealth. Russell and Katharine Burrage continued to live at 197 Beacon in 1935, but had made Beverly Farms their home by 1936. On November 7, 1935, 197 Beacon was acquired by Dr. Charles Alonzo Draper, a chiropodist. 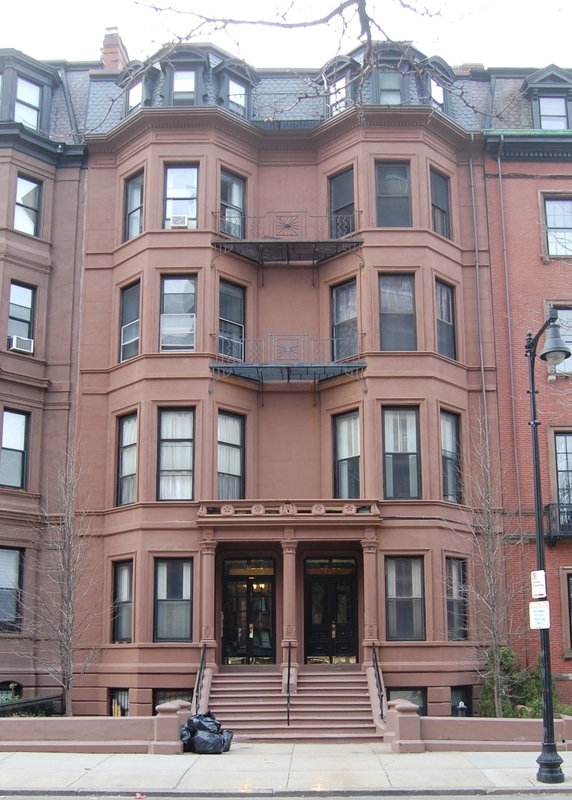 He and his wife, Gladys Lucie (Garrett) Draper, lived at 57 Marlborough, where he also maintained his medical office. In November of 1935, Dr. Draper applied for (and subsequently received) permission to convert 197 Beacon from a single-family dwelling into nine apartments. On November 2, 1937, he transferred the property into his wife’s name. In October of 1941, the Drapers’ son, Charles Elliot Draper, a real estate dealer, acquired 199 Beacon and converted it into a lodging house. The Drapers and Charles Elliot Draper moved there from 57 Marlborough in about 1946. Charles A. Draper died in 1963 and on April 3, 1963, Gladys Draper transferred 197 Beacon into her name and the name of her son, Charles, and on the same day, he transferred 199 Beacon into both their names. On February 20, 1968, Gladys Draper transferred her interest in the properties to Gregory H. Adamian as trustee for her benefit and the benefit of her son. On March 6, 1974, 197 Beacon was acquired from Gregory Adamian as trustee and conservator of the property of Charles Elliot Draper by real estate broker and investor Patrick J. Glynn. He had purchased 199 Beacon in January of 1972. 197 Beacon remained an apartment building, owned by Glynn Realty Associates III, LLC, in 2015.